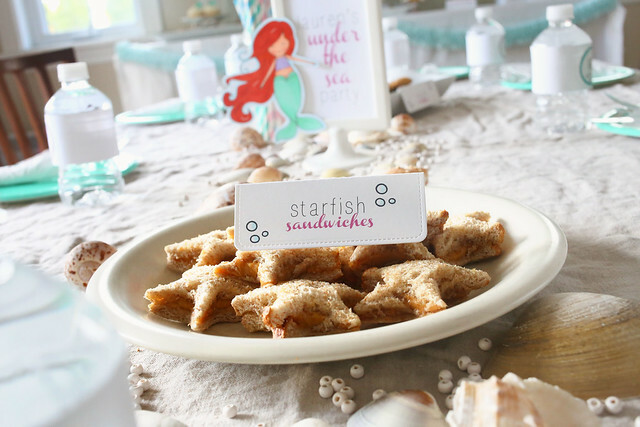 Lauren's mermaid party and a free mermaid for you! 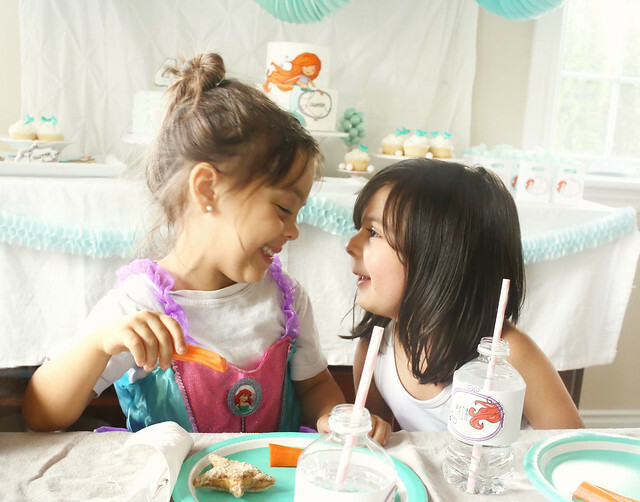 I'm so excited to share with you the party that I helped put on for my niece, along with huge help from Marlyn (Montreal Confections.) 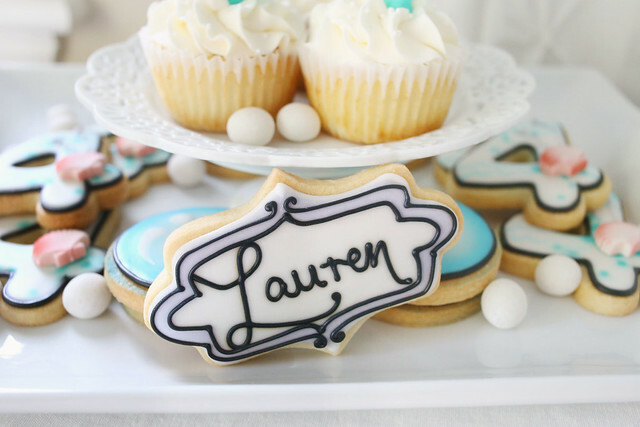 All of the goodies on the sweet table were made by Marlyn and were completely stunning. This is my niece, Lauren. 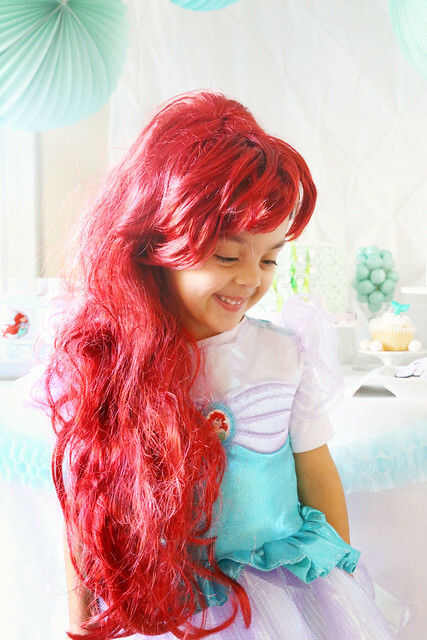 She just turned 4 and is currently obsessed with all things mermaid. 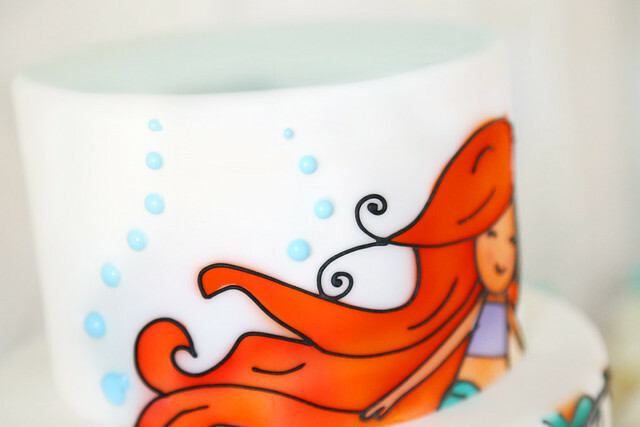 Ariel, to be specific. The wig is killing me. Here's what the entire party looked like, at a glance. I love the linen tablecloth that we used for the main table - we kept it wrinkly because I thought it looked like textured sand. Yes? ha. 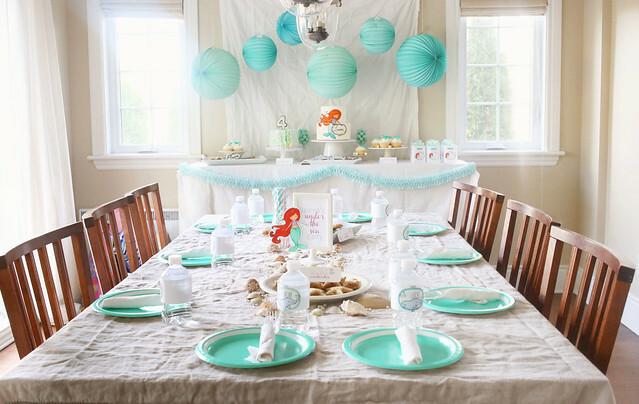 The party table was bright and airy, and a little dreamy. It turned out exactly how I hoped it would! My sister bought the watery-colored hanging balls from Michaels, and I added a honeycomb garland (that I made from scratch, thank you very much). We kept it simple and fresh. My favorite thing on the dessert table was this cake. 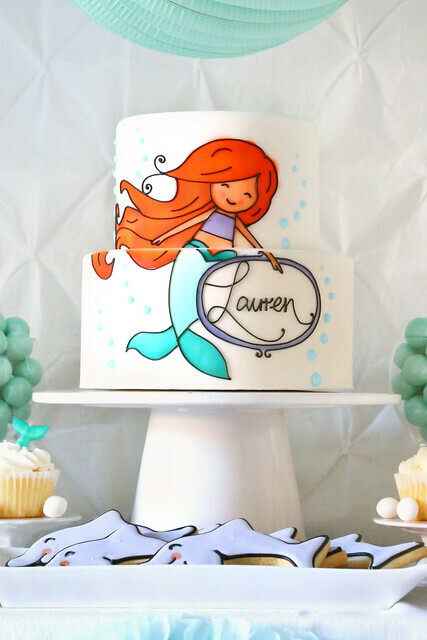 I mean, that's my artwork.in cake form. It was all piped and airbrushed to perfection. Marlyn has a tutorial video on youtube today. 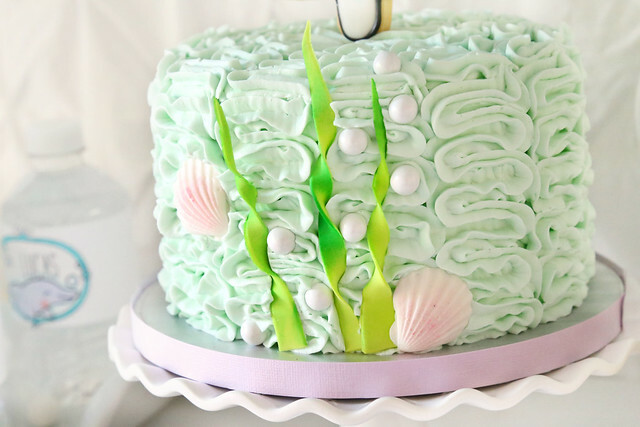 Even if you would never recreate these desserts, please go and watch the video! It's amazing to watch an artist at work - I love seeing behind the scenes stuff! CLICK! I know my card-making friends will appreciate this: look! 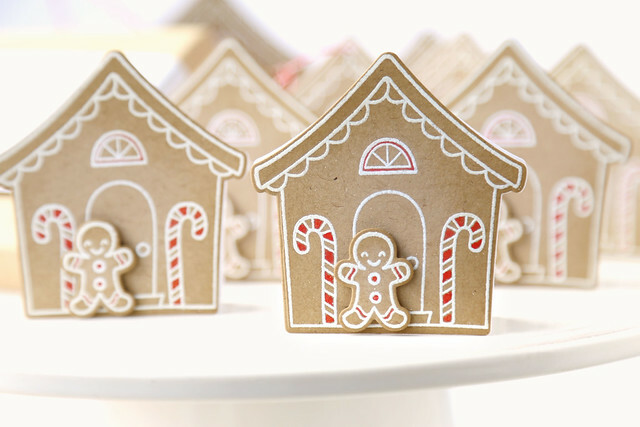 sugar enamel dots! If one cake wasn't enough, Marlyn made a second cake. She knows how much I love her buttercream. hee. 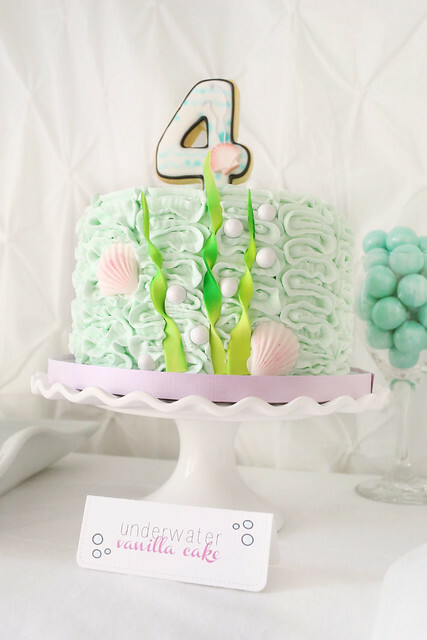 The shells and little pearls were the perfect simple touches. 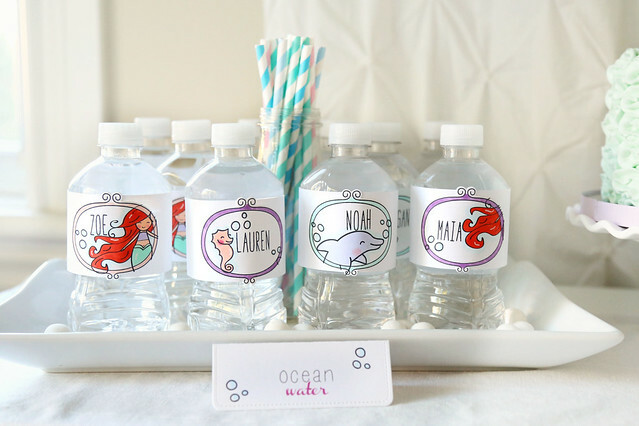 I created labels for the water bottles, and a few food markers using a mix of stamps and digital artwork. 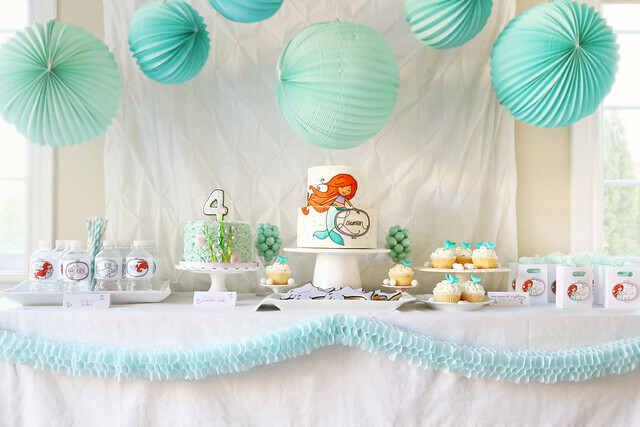 Everything was kept light and white, with pops of color. 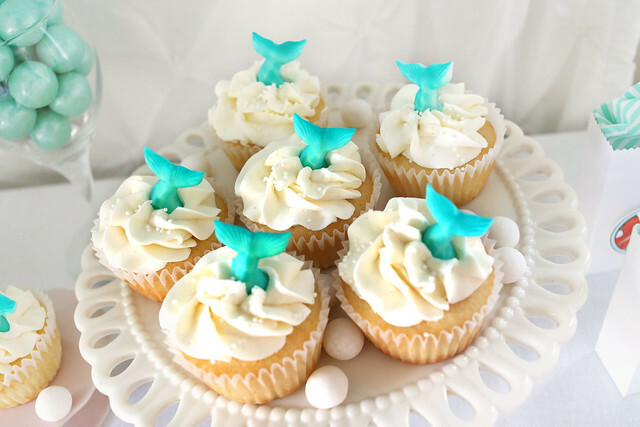 These cupcakes were labeled mermaid sightings and were so cute! 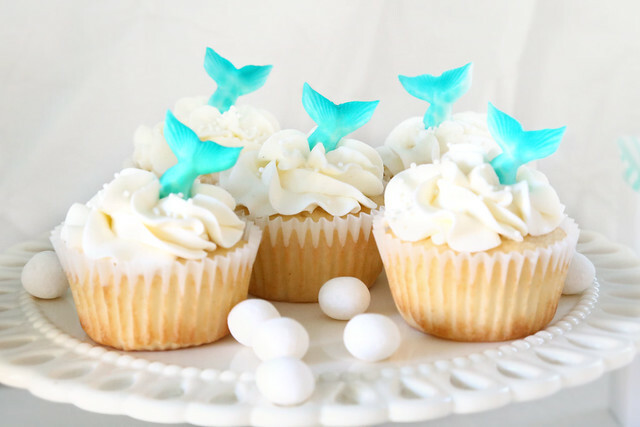 I love the sugar tails sticking out! Of course, Marlyn made cookies. 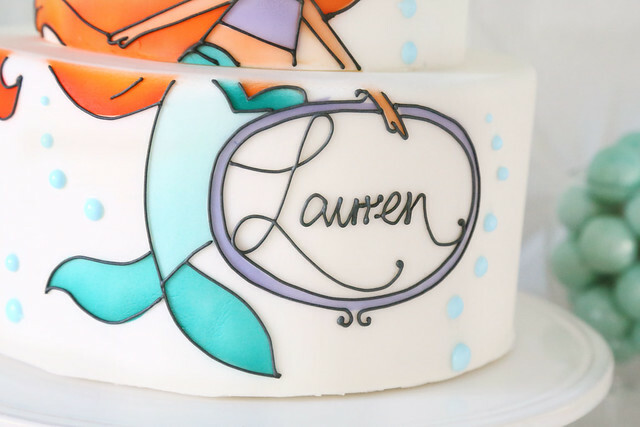 Like this one, just for Lauren, and the number 4 on top of the ruffled cake. And the school of dolphins. hee. They make me smile! Marlyn hand-cut these to match the lawn fawn stamp! 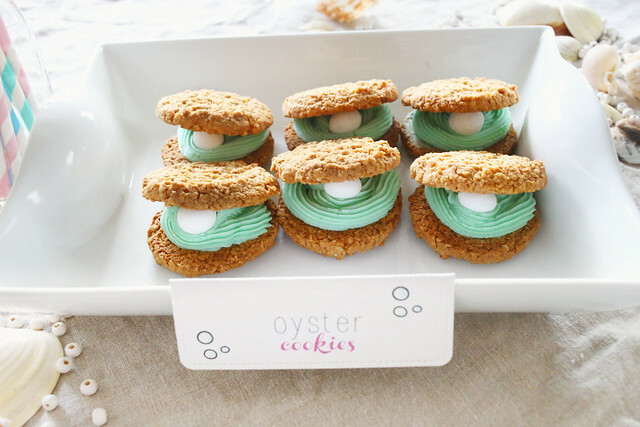 and these pearly oyster cookies. so cute! I made the take-home favor bag, and my sister stuffed them with goodies. All in all, I'd say the birthday girl was pretty happy with what we created for her! I hope you like it too! I have a special gift for you to take home too. 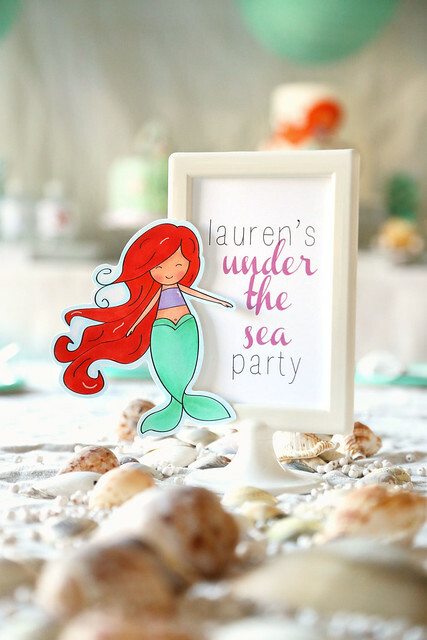 If you like the mermaid that I illustrated to match the lawn fawn stamps, then download her and print her out for yourself! I'm offering her to you in JPEG and PNG formats. Click on the link that suits you, and save to your computer. If you will use her with the lawn fawn critters, you'll need to shrink her down a bit! 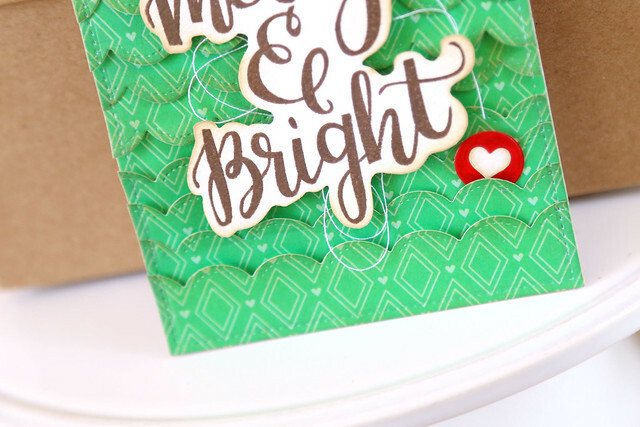 It's the last of the stamp highlights today, and we're showing off the fun, new alpha set: Block Party Letters. The penguins are so cute - I had to bunch them all up together. When you are masking multiple elements, I suggest stamping it all out on a scrap paper first, so you could determine the stamping order. I stamped the 2 middle dudes here, leaving space between them for a 3rd guy to be scrunched in. Then, the ones on the fringes, with their accessories. They kill me. 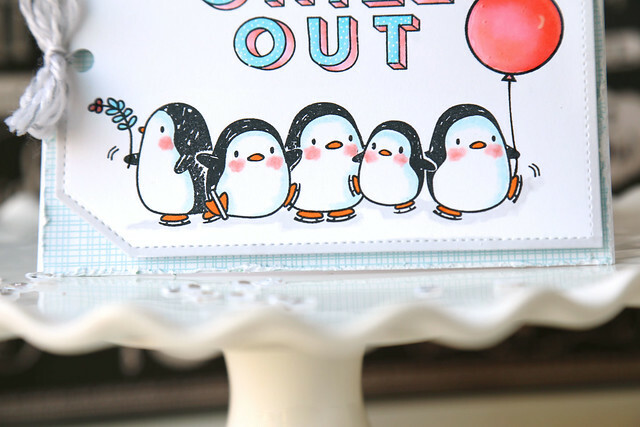 I love how easily they make a card come together - I mean, just a swipe of blue to highlight their white bodies, some blushy cheeks and orange beak and skates... er, yup. skates. I colored the letters with pink and blue markers, and then dotted on some polka dots with a white gel pen. 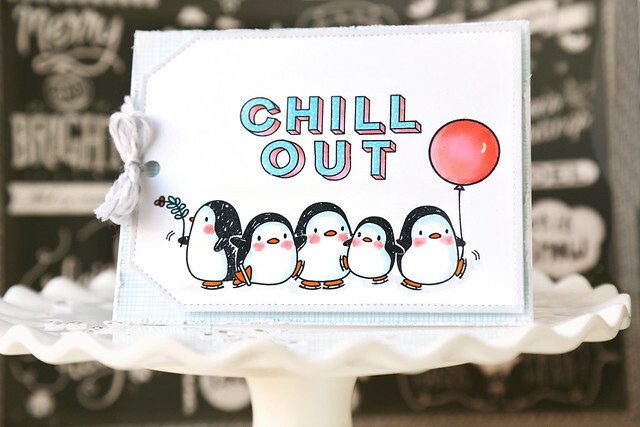 It all works perfectly with the pink and blue colors: on the letters, on the penguins. I'm a matchy-matchy kind of girl. I mounted everything onto a giant tag, which I framed out by coloring a soft grey around the edges. And glossy accents for the balloon. That was a must, no? I hope you like it! Check out the ME blog for even more inspiration! Hi there, and welcome back to another day of Mama Elephant stamp highlights! 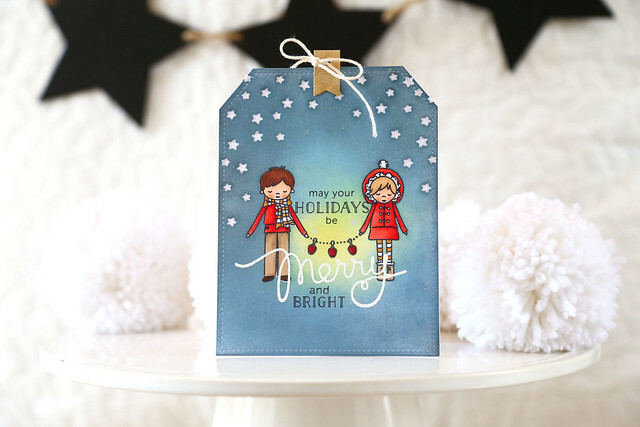 Today, we're showing off the beautiful hand-lettered sentiment set, Season's Greetings. I made a shaker card! 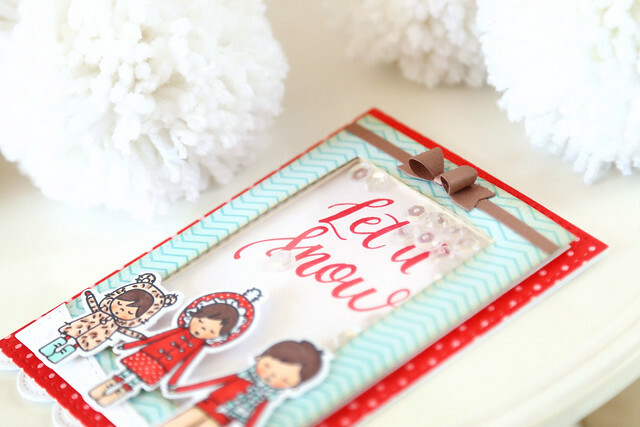 I cut into the femme frames rectangle with the new instalove die - it created the perfect opening to showcase the greeting and sequin flurries. I did some stamp tampering again, shrinking down the two largest carolers so that they looked more like my own trio of children. And then I used the partial die-cut technique to cut them out together. I know, I'm obsessed with doing this, but it looks amazing! I added white polka dots to the middle girl's coat and skirt, and then carried the look to the card base, using Basic Borders. The bow makes it feel like a Christmas present! It also helps balance out the carolers at the bottom. Even though I've been showing it off for awhile now, today is the official alpine carolers highlight day over at Mama Elephant. 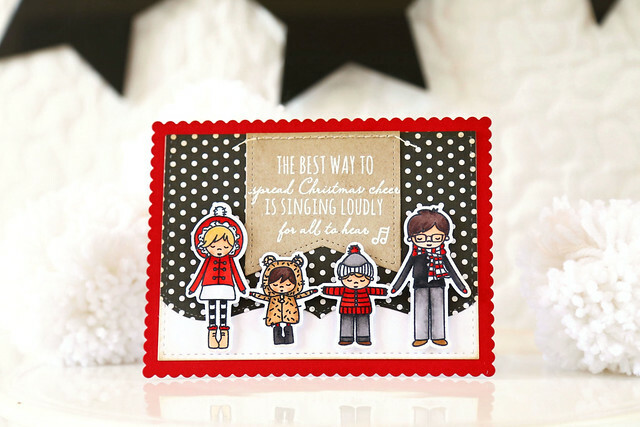 No crazy masking - just stamping and die-cutting in the simplest way. A family, holding hands and singing their way into your hearts. Sometimes, it's enough to just show off the images and put together a fun card. I stuck to a light brown, grey, black, red and white color combo - in the coloring of the images and in the background papers. 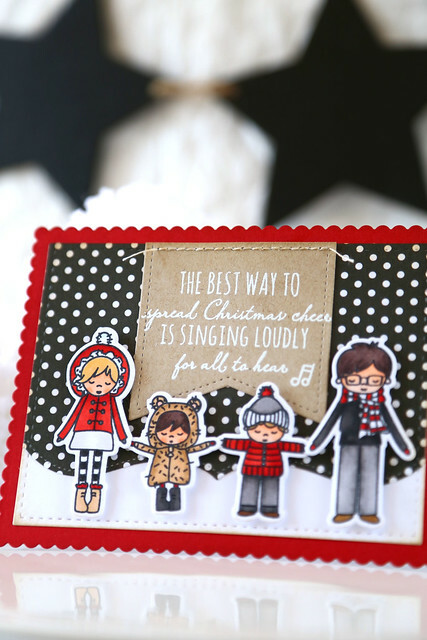 The carolers, the quote from Elf, the polka dot paper... this card just makes me happy. I hope you like it too. Check out more from the rest of the design team on the ME blog today! 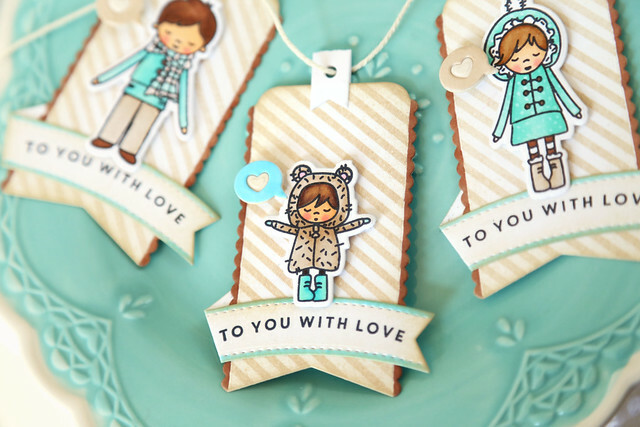 We're back for another day of Mama Elephant stamp highlights, and we're showing off the new Boutique Borders. Remember I told you that it would be easy to customize the look of the carolers? The ones on either side have been tampered with. hee. 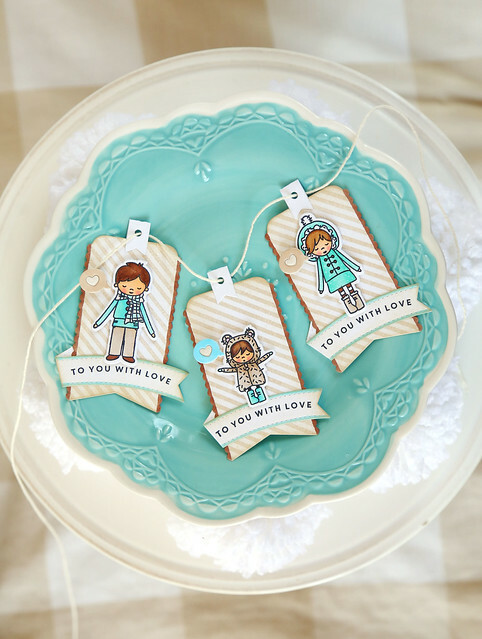 I used the ones in blue for these tags, and you can see the difference in the photo above. All it takes is a little careful inking. Wipe off the ink below the skirt (or shirt in the boy's case) before stamping down once, and then ink only part of the legs and match it up. 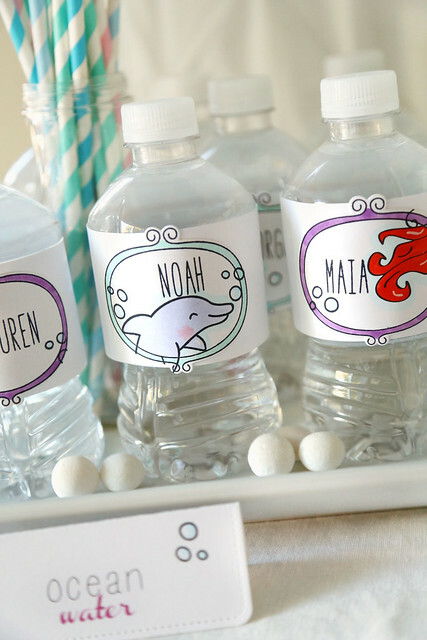 I love that it's so easy to do with clear stamps! 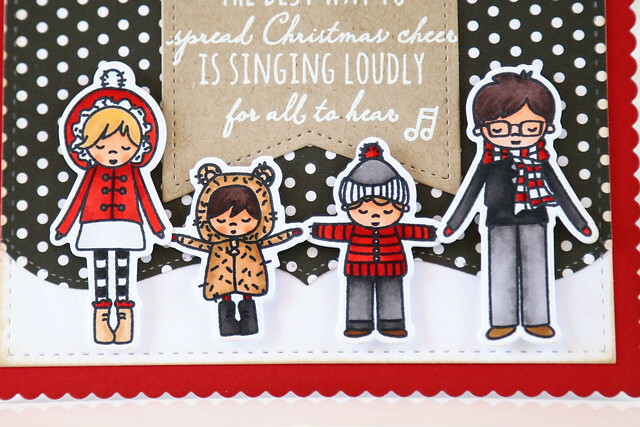 When you are die-cutting the smaller carolers, you'll want to make sure to not cut it all the way through in one pass. 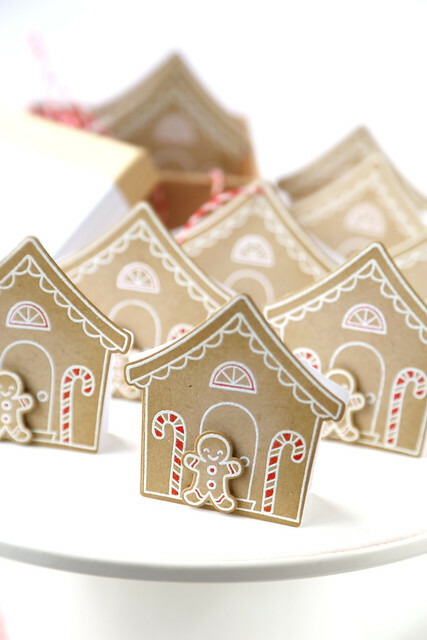 Use the partial die-cut technique to send it through and cut each end separately. 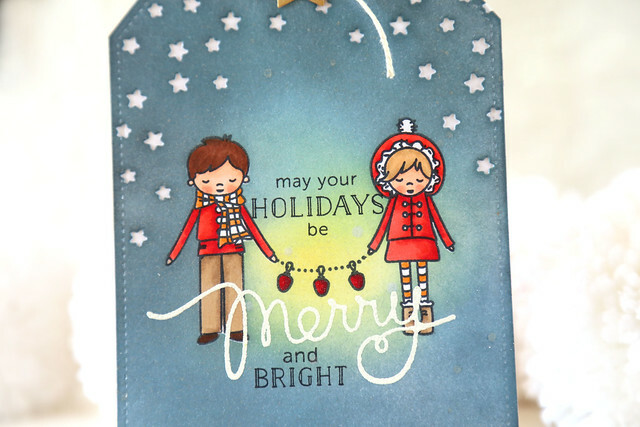 Once I stamped and die-cut the carolers, I popped them up onto a tag base - I love this shape, with its scalloped border. I swiped the scallops with a brown marker to make them pop, and did the same to the edges of the sentiment banner with a blue marker. It adds interest and polish to the final tag with hardly any effort at all. The sentiment is from bloomsies, and fits perfectly onto the banner found in the tags a lot set. I hope you like what I've created! In case you missed it, I also turned the "daddy" caroler into a spitting image of my own hubby, hee hee - click! Hi there, and welcome back to another day of Mama Elephant stamp highlights. 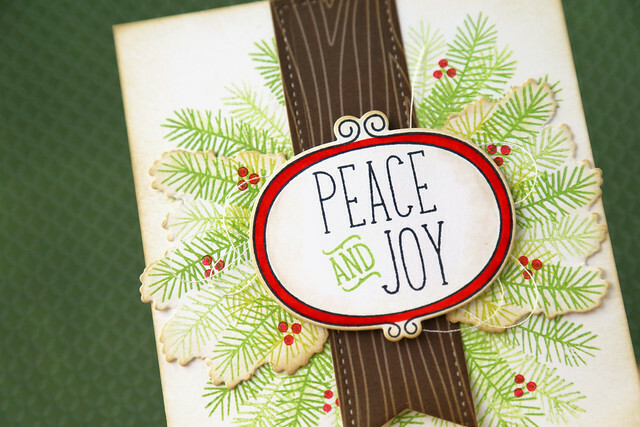 We're showing off the hand-lettered, big-lettered Christmas sentiment set, Peace on Earth. I made another giant tag, because I love them so much. Everyone is getting a giant tag for Christmas this year. 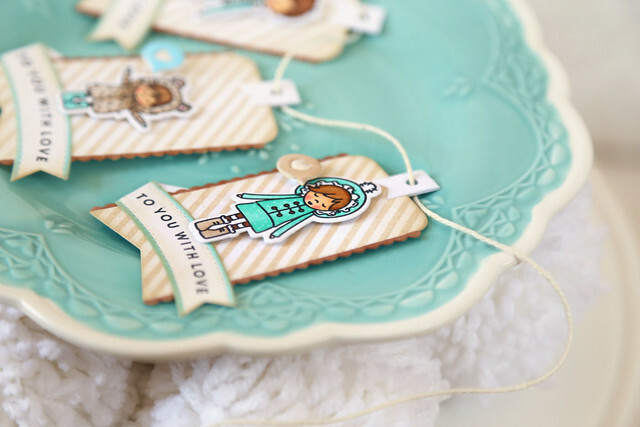 I used the new scalloped border to create an all-over fringe on the tag base. If you look closely, you can see that the scallops work their way down the tag, but up from the bottom as well. 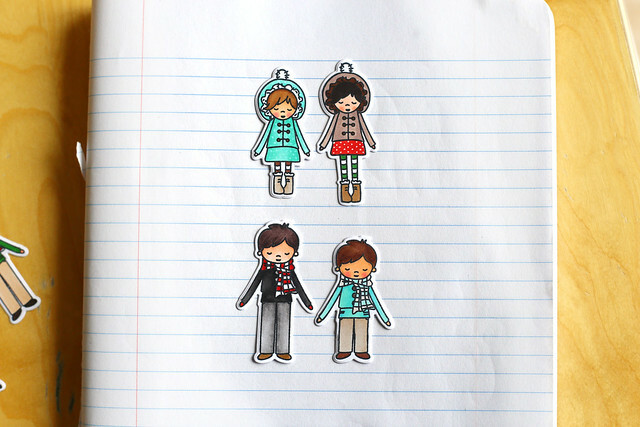 I hid a strip of patterned paper into the space where they would meet. I wanted the outside edges to have a clean, straight look. 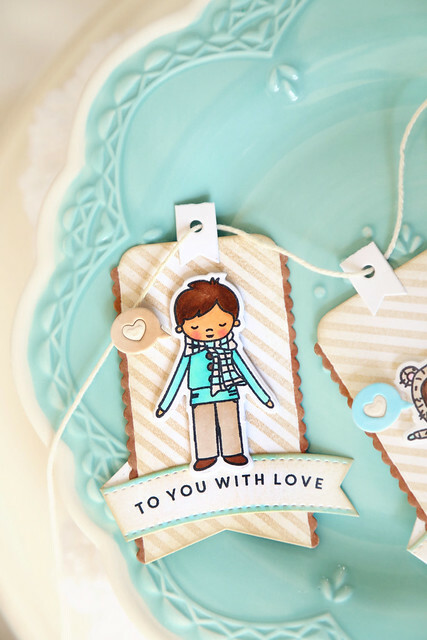 I stamped and fussy-cut the giant sentiment, so that it would pop right off the tag. There's more to see on the Mama Elephant blog this morning - click! It's time for Mama Elephant stamp highlights! 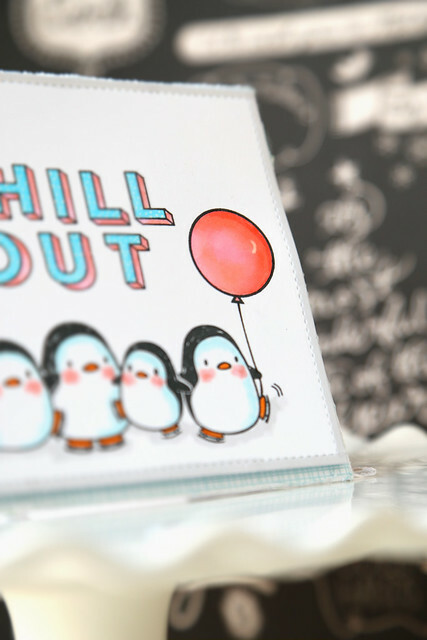 We're showing off 2 sets today, arctic penguins and jolly & merry. The sets were meant to work together, with images in the one and sentiments in the other. I made 2 cards for you today. First off, a sweet little lonely penguin. The ice blocks in the set are really small, and I wanted to have a huge one that would fill the entire card width. Some selective inking and voila! If you stamp the penguin first, and then build the bigger ice-block around him it works so much better. You don't need the lines to join up over the masked penguin. I hope the picture makes sense to you! It's really easy to customize almost any stamp this way. Once I had him on his larger ice block, I used the partial die-cutting technique to cut them out together, and set him adrift on the ocean. Two different copic markers are all it took to make a sea and sky, and I used a white gel pen to doodle in some waves. 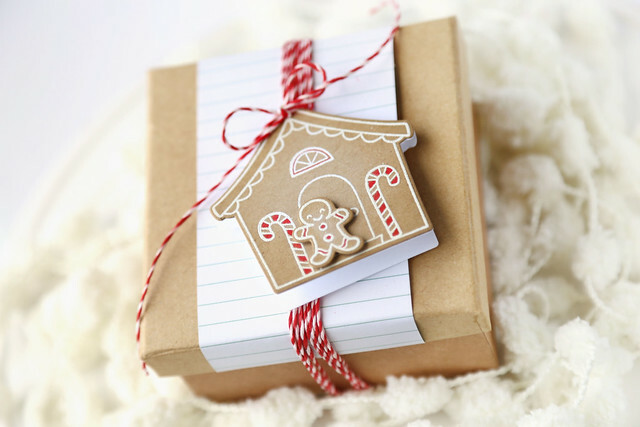 The sentiment is from jolly & merry, and so cute! 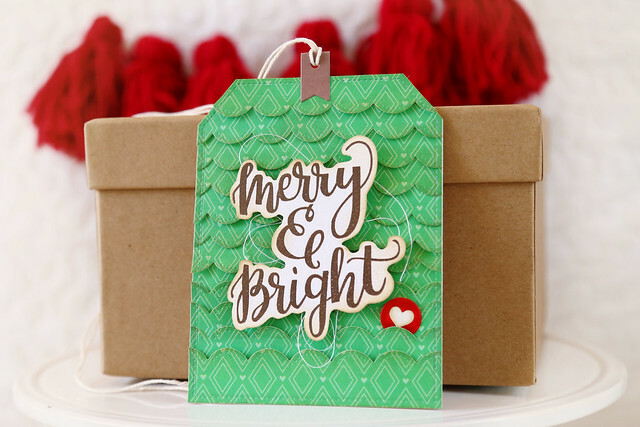 I created a giant tag shaped card, and used the starburst cover as a backdrop to my scene. The alpine carolers are holding a string of Christmas lights. Aren't they cute? A lot of masking and inking to get the entire tag covered in a night sky color, with a yellow glow for the sparkling lights. I heat-embossed "merry" and let it spill up onto the images. It's nice and thin, so it doesn't overwhelm the carolers. I hope you like both projects! 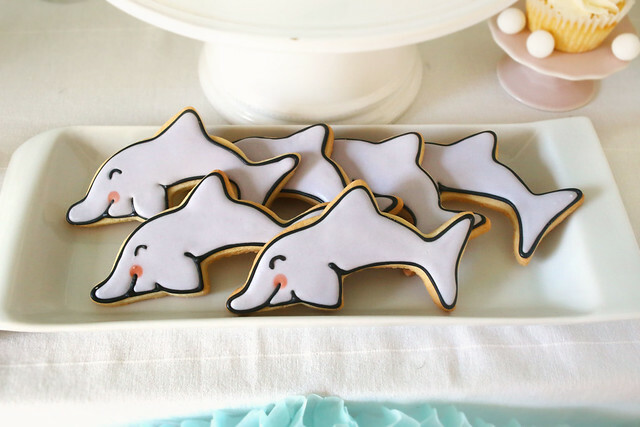 There's more to see on the Mama Elephant blog today! I don't know about you, but I'm getting lazy. If a set doesn't come with matching dies, I don't use it as much. Thank goodness there are now dies for Sweet Christmas. 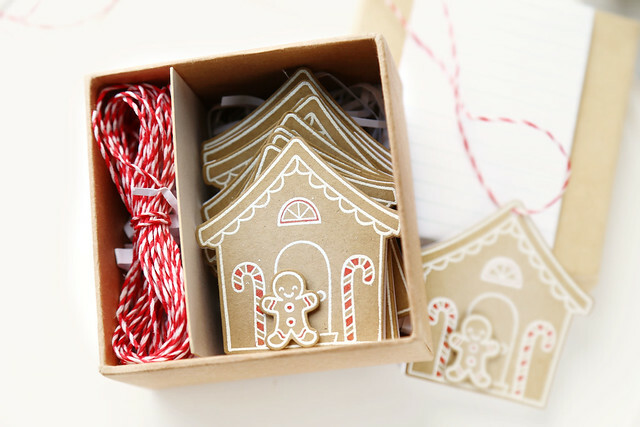 I have been wanting to make gingerbread house tags for such a long time, but never wanted to hand-cut them all. 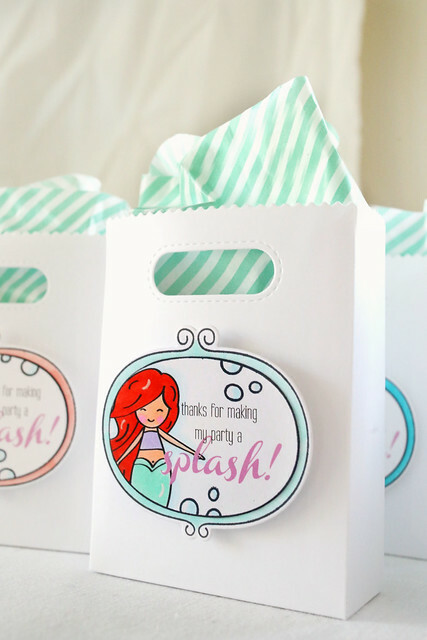 If you wanted to make them yourself, you can get 10 tags out of 1 sheet of kraft cardstock. That's pretty awesome. I watercolored in some red after having heat-embossed them all, but they looked just as cute without that splash of color. I went the extra set of adding a second house to the back, so that they can be used for folded tags, or teeny tiny little cards. I like having options. Hope you like it! There's more to see on the lawn fawn blog this morning - click. I'll be back in a few hours with new Mama Elephant projects - see you soon! Welcome back to another day of lawn fawn's october inspiration week! 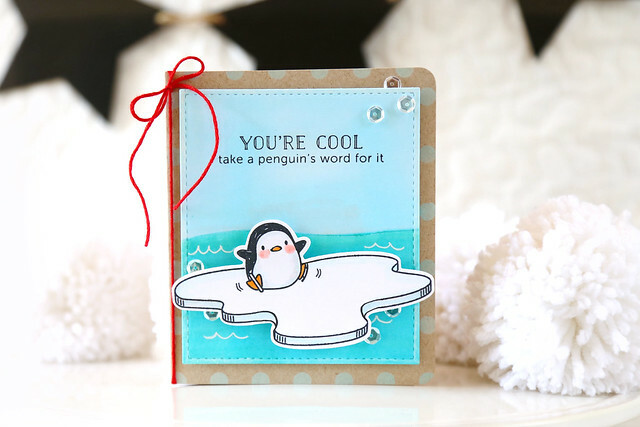 We're all skating around with winter penguin and the scripty joy die. What I did: I die-cut "joy" first, but stopped the die-cutting right after the "y." I didn't follow through to the end. Then, I drew pencil lines of where I wanted the script to go, and stamped the penguin right there at the end. 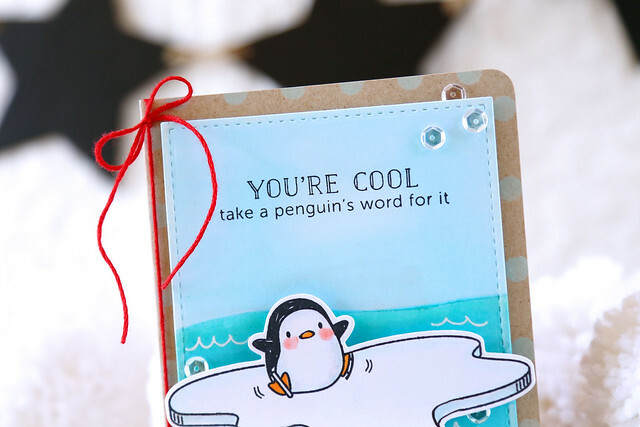 The fussy part was die-cutting the penguin. I sent it through the machine a few times, at different angles, to cut everything but around his left skate. Whatever the machine couldn't get to, I cut out with scissors. When the entire thing was cut out, I propped it up on foam squares. You know, to show off my careful work to the full! And, for added drama, I placed it all onto a siren-red backdrop. I hope you like it! 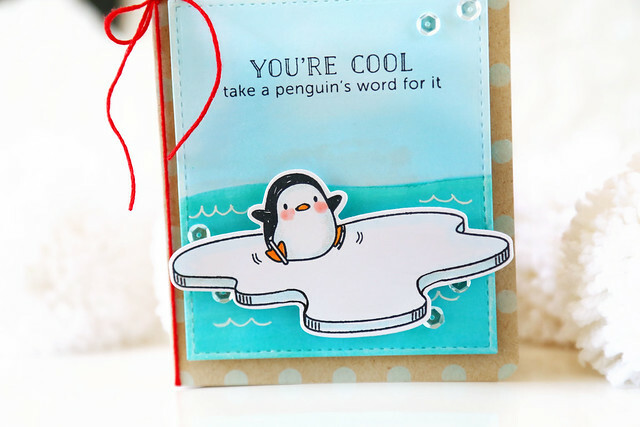 Check out what the other design team members made using winter penguin and the scripty joy die - click! Hi there! and welcome back to another day of lawn fawn inspiration. Today, we're showing off new alphabets! Finley's ABCs and Violet's ABCs. I put the Violet's letters into the frame from Sweater Weather. They fit perfectly! And I love the fancy "and" included in this alphabet set. So pretty. 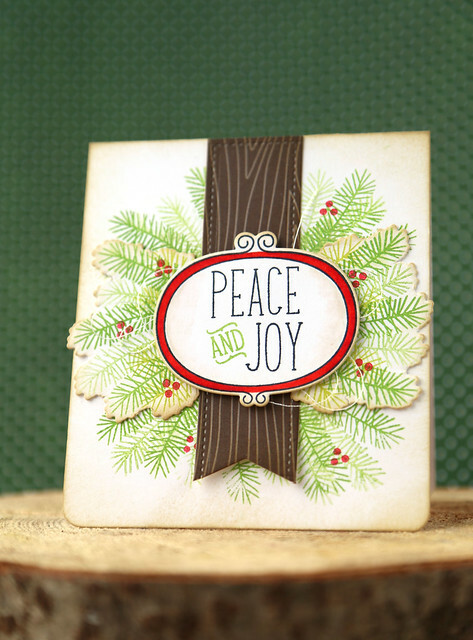 I stamped an entire wreath using Deck the Hall branches onto the card base. Then, I stamped out half a wreath onto a separate piece of cardstock and cut it out using the partial die-cut technique. That way, I got all of the nice die-cut edges without the bulk of layering individual branches. 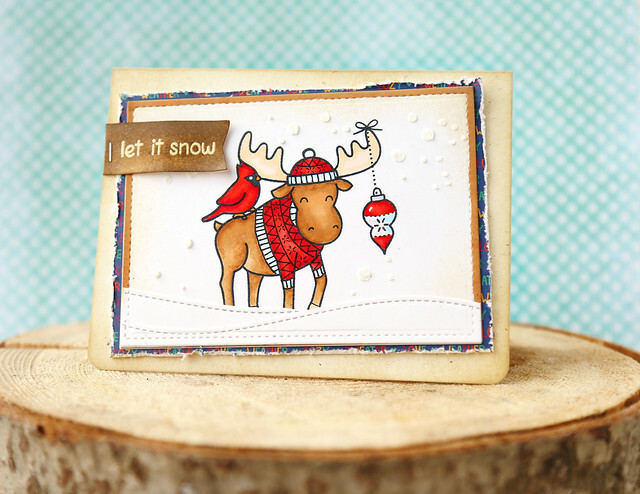 lawn fawn october inspiration week: a sweatered moose. Today, the design team is showing off critters in the arctic. I couldn't help but draw him a little sweater, and doodle the same pattern onto his hat. 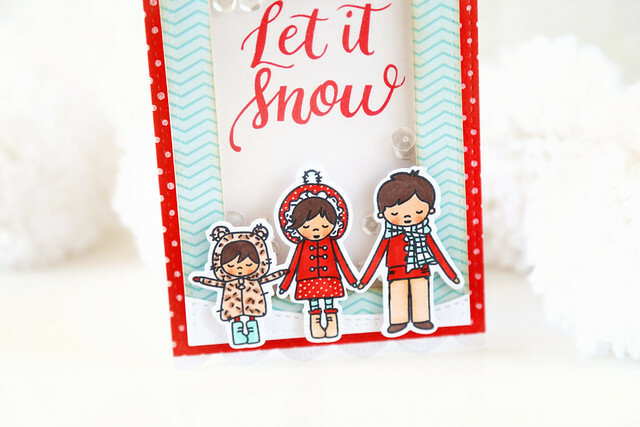 I wanted this card to feel as warm as possible, so I used a falling snow stencil and some embossing paste around the focal image, and roughed up the edges of the patterned paper. The texture created lends that cozy feel I was after.